This undated view is provided by Neil Blinco and shows NG15 No.118 in operation on the Bennett Brook Railway. This locomotive was built by Henschel & Son, Kassel, Germany (builder's no. 24476 of 1938) to a South African Railways design for the Otavi Mining and Railway Company, which operated a lengthy railway across Namibia. The NG15 class was a development of the earlier Hd and NG5 classes locomotives, and the class grew to 21 locomotives following orders for additional locomotives from Société Franco-Belge and Henschel & Son. A significant feature of the NG15 design was the use of a Krauss-Helmholtz bogie, which allowed the locomotives to negotiate sharp curves. The Krauss-Helmholtz bogie links the pony truck to the leading pair of driving wheels, which are able to shift laterally to accommodate the curve, while the driving axles remain in parallel. The NG15 class are commonly known as "Kalaharis" although they never worked across the Kalahari desert! 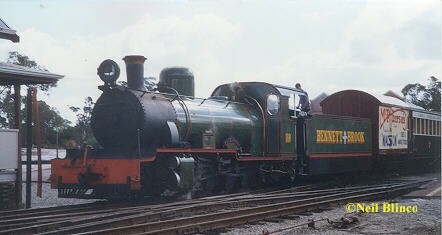 NG15 No.118 and No.123 were purchased by the Bennett Brook Railway and imported to Australia on 21 April 1985. Following restoration, NG 118 entered service at the Bennett Brook Railway on 15th October 1994 and continued in use until 2003 when withdrawn for overhaul. No.118 is now awaiting repair before it can re-enter service. Information provided by Neil Blinko via email dated 7 April 2004. Wikipedia entry for NG15 class locomotives, viewed 19 November 2012.